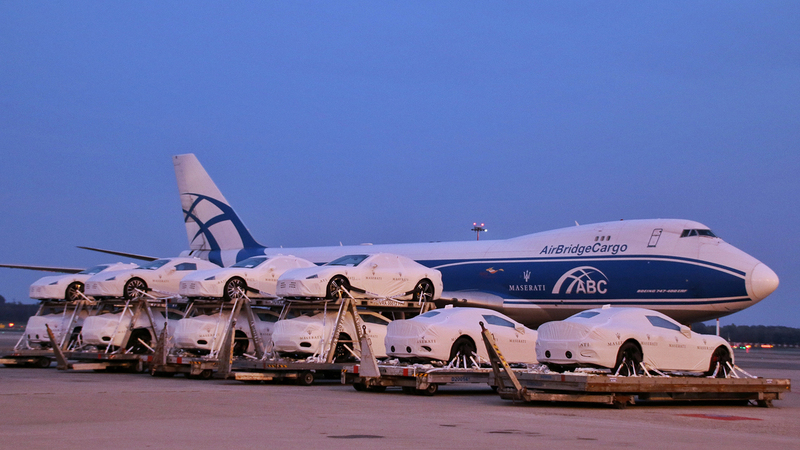 AirBridgeCargo Airlines (ABC) has delivered twenty-eight shiny new Maserati Gran Turismo vehicles onboard one of its Boeing 747 freighters from Milan to Tokyo. The charter flight on behalf of Agility Logistics was operated from the largest airport in Milan, Malpensa, to Narita Airport with a stop at Moscow Sheremetyevo Airport in compliance with all standard operational procedures. ABC has developed and introduced special standard operating procedures for the transportation of vehicles, supported by a dedicated team of experienced professionals to ensure every delivery is handled with the highest attention. The Maserati cars were carefully handled by Alha Airport MXP and positioned securely onto double-deck car racks to ensure the efficient use of space and safe transportation. ABC’s Boeing 747 proudly displayed Maserati branding for its eye-catching arrival in Tokyo, which was greeted by around 300 guests and media representatives waiting for the aircraft to taxi to its parking spot to commence unloading. AirBridgeCargo’s highly skilled loadmasters, together with three attendants from Maserati, used the offloading of the cars in their white protective covers to demonstrate the airline’s smooth, safe and seamless operational procedures. Guests were then invited to attend a welcome reception at the airport, with a formal address from Maserati and the presentation of the cars to customers as well as a unique luxury car photo opportunity for the media. “This is a unique event as it gives each party involved the perfect opportunity to observe vehicle transportation procedures first-hand. We are honoured to be part of this project and to have been entrusted by the delivery of these magnificent Maserati cars. Our abcXL product was developed in close cooperation with our customers for such an operation to combine tried and tested principles with innovative ideas for efficient and reliable deliveries,” highlighted Sergey Lazarev, General Director of AirBridgeCargo Airlines. In the first nine months of 2017, ABC transported over 45,000 tons of vehicles and automotive spare parts throughout its global network. This 24% year-on-year increase is illustrative of ABC’s reputation as an experienced transportation partner to leaders in the Automotive industry.